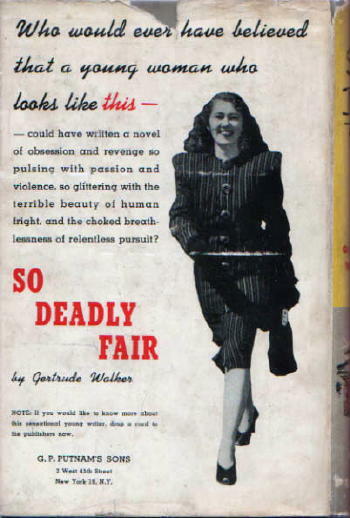 * * So Deadly Fair (Putnam, 1948, hc) [Minnesota]. Bestseller B105, digest pb, abridged, 1948. Popular Library 424, pb, 1952. 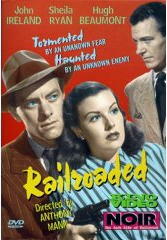 So Deadly Fair has a modest reputation among fans of hardboiled mysteries, but otherwise is probably little known. I don�t remember seeing a copy myself, in any of its various editions, although it�s not uncommon, at least in paperback form, so I probably have. It says she married Charles Winninger who she met in 1932 when both were in Showboat. The year of birth you have in CFIV as 1920 seems unlikely to say the least. I found some more on Gertrude Walker here. This message in [theYahoo group] Rara-Avis mentions a third book The Face of Evil, but I can’t find anything about this title. Maybe the third book you have of hers listed as The Suspect is by a different Gertrude Walker? 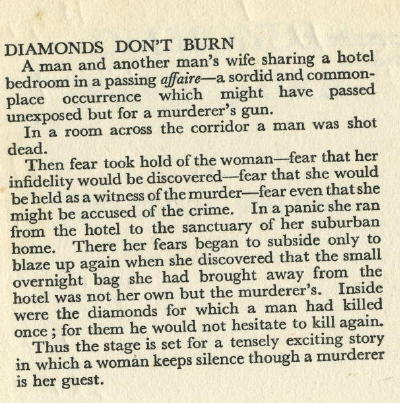 Odd that her second book Diamonds Don’t Burn (the one I have) wasn’t published in the US. Al sent the email on to me, along with his reply, and I�ll get back to that in a minute. Some of these I�m sure you may have heard of, others most probably not, but they all seem to fit the category of black-and-white film noir, some more than others, of course. Walker also has a few miscellaneous credits in television, including a stint on The New Adventures of Charlie Chan (1958). There is a Gertrude W. Winninger in the social security death benefits record, born 4/8/1902, died 6/1995 in Palm Springs, CA. I rather think that’s the author in question, and that I (or my original source) transposed a couple of digits into giving her a birth year of 1920. The fact that Charles Winninger died in Palm Springs seems to clinch it for me. What think ye? The birth and death dates now having been established with a certainly, it was time, I thought, to take a closer look at the books she wrote. – wrote for TV serials like The Californians and The New Adventures of Charlie Chan. I read only the first one. Some American critics compared the novel to James Cain’s works at the time of first publishing. She also wrote some short stories starting during her twenties. There�s some duplication of information here, so please forgive me for that. I haven�t yet looked into the short fiction that Walker may have written. Etienne�s mention of a book entitled The Face of Evil, one that Al Hubin didn�t seem to know about, was what attracted my attention the most. 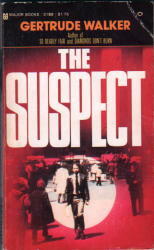 That the date (1978) was the same as the book The Suspect (Major, 1978) made me wonder if perhaps the two books were the same. Neither one showed up for sale on the Internet, but knowing that Bill Pronzini collects the paperbacks published by Major, I emailed him. In a moment, the results of that inquiry. In the meantime Jamie had sent me a scan of the jacket blurb for the book he had, the British hardcover, Diamonds Don�t Burn. My thought was that perhaps the British edition was simply retitling of the earlier US book, So Deadly Fair, but Jamie said no, the in book he had mentioned the first one by title. I think the scan is readable, and it looks as though the book itself would be worth reading. Why it was never published in the US is a question as yet unanswered. An email reply from Etienne Borgers was in essence an apology that he hadn�t any more information about Walker than was posted earlier, but no matter. He had already posted more information about Gertrude Walker than was available anywhere else. Al is surely right that Gertrude W. Winninger and Gertrude Walker were one in the same individual, and that her correct birthdate is 1902, not 1920. 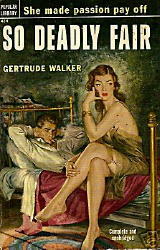 Attached is a photo of Gertrude Walker from the back jacket of her first novel, So Deadly Fair. The accompanying bio calls her “a young woman,� and the photo indicates the same, but my guess is that it�s just publicity hype and the photo an old one. My copy of the book includes a separate publicity photo in which she looks older, closer to her age at the time the novel was published, 46. 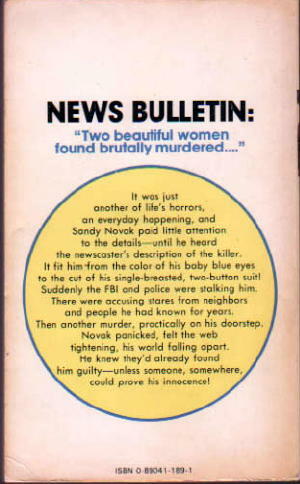 The Suspect does indeed exist; attached are scans of the front and back covers. If it�s a novelization of a 1943 screenplay, it was definitely updated to the 70s milieu. I can�t say for sure, but The Suspect is probably a retitling, either by the author or Major Books, of a manuscript submitted as The Face of Evil. I don�t know of any novel by Walker or anybody else published in 1978 or thereabouts under the latter title. Diamonds Don�t Burn and So Deadly Fair are definitely separate books. Fair is a sort of hardboiled and frenetic road novel that jumps from Minnesota to New York City and points in between and is narrated by a male protagonist named Walter Johnson. Here�s the front cover of the Major book. It�s obviously a tough book to find. If it�s on your want list, good luck to you! Bingo. We have a match. Had a minor acting role in this crime film. Described as a homefront comedy, but the hijacking of trucks is part of the plot. GW responsible for the story along with Edgar G. Ulmer. Described as a crime drama with songs. GW responsible for the adaptation. Described as an animal and youth drama. (involves a kidnapping plot). GW was screenwriter. Very interesting article. I like those articles mentioning authors lost in the past. In Germany three novels of Gertrude Walker have been published in the eighties. In addition to “So Deadly Fair” and “Diamonds Don’t Burn”, there is a third one, “An unfamiliar man”, that has not been mentioned. I don�t know the publication date, however, the protagonist is a man who has an airplane crash in Paris. He is one of three survivors but has lost his memories. He is giving himself the name Jacques Fournier. Then someone is interested in his person, and he wonder whether he was a millionaire or a murder in the U.S.A. That�s the short translation of the cover text. Probably it helps. Thanks, Claus. This third title doesn’t seem to match any of the books or screenplays that Gertrude Walker is known to have written so far. It must have been a previously unpublished work that somehow got dusted off and sent to Germany. The plot line certainly sounds like the kind of story she wrote. I sell books through Amazon, from my home in northern California. I just acquired a nice copy of Walker’s second book, Diamonds Don’t Burn. You can copy it from there; or email me, and I’ll send you a copy. Thanks for the information about the author I found here. I realize this is an old thread, which I stumbled on accidentally, but I wanted to add a few things about Gertrude Walker, author of “So Deadly Fair.” She was a friend and contemporary of my mother’s, and I knew her as a child during the 1960s and very early 70s (I’m 58 now, so was old enough then to have pretty distinct memories). My mother was born in 1910 and she and “Gertie” (as we knew her) went to Ohio State together. So I don’t believe the 1902 birth date. It’s more likely that she took some years off her real birth date for publicity purposes, so I can believe that 1920 is the year she gave. I also don’t believe she was married — I only knew her as single, with no reference to a past marriage — and tend to think there may have been another, older Gertrude Walker also involved in show biz, and that the two have been confused. I do know that “our” Gertrude moved from Ohio to California at some point and was a Hollywood writer, and that she and my mother re-established their friendship when my mother moved to California after WW II. Gertie would always be invited to our holiday dinners, since she was single and had no family, and we kids would love seeing her, as she was a real character and funny as hell. I would describe her as flamboyant in a dignified sort of way. Drove a Studebaker Hawk which even then was eye-catching. I believe that after her major writing years in the 40s and 50s had passed, she made a living as a freelancer, ghostwriter, editor, etc. — whatever she could get. She stayed in sporadic contact with my older brother through the early 1990s, so I can believe the 1995 death date. Gertie was nothing if not memorable, and all my memories of her are positive. I would like to give you more information about Gertrude Walker Winninger. She is NOT the Gertrude Walker, author. The dates you have are accurate and she was married to Charles Winninger. They came to California when Charlie contracted with 20th century fox in 1935. They built a home in Tarzana, she was the homemaker, never a writer, never appeared in movies, while he appeared in over 60 mnovies. You see, she was my Great-Aunt. Her sister was my maternal grandmother. Thanks for the information. It looks like all of our mutual speculation was for naught, that we’ve combined data on two different Gertrude Walker’s. I’ll pass along what you’ve provided to both Victor, Al and Jamie, and we’ll make the revisions accordingly. You’ve been very helpful. Thanks again! To Carol Messing, I have an Aunt Gertrude married to Charles Winninger ,and Aunt Ann could you be a relative of mine? I was very young when we would visit so my memory is vague. Sorry to be so late weighing in on this, but I suddenly had the urge to look up Gert Walker while I was watching some old B&W mysteries on late night TV and found this site. I knew the writer Gertrude Walker late in her life. She was an old friend of my great uncle who was quite a good artist here in LA. He came here from Ohio in the 30s and was born 1908. She was somewhat close to his age, perhaps a little older. I met her @ 1987 and she was then living alone in BH adjacent and to my knowledge had never been married. She was a member of the Writers Guild (WGA) and we attended movie screenings. She had studied gemology at GIA — very prestigious gemology institute—had learned to cut gemstones and even had her own cutting equipment in her apt. Hence the inscribed quote reference in G. Johnson’s email above that she cuts diamonds. Near the end of her life she gave me a sizeable Aquamarine that she had cut years before. She also spoke of knowing and corresponding with Joan Crawford, indicating that Joan took a special liking to her. She died at a senior residential home here in LA — sometime @ 1993? She had a cousin in Palm Dessert, I believe, who looked after her affairs toward the end of her life. I have a beaten-up copy of So Deadly Fair that she loaned me. It has copies of quotes from published reviews and of the New Yorker review taped inside the front and back covers. I also have a 1991 group Polaroid with her in it. She was quite short, and yes, quite funny. Thanks for all of the interesting information. I appreciate your stopping by! I have also discovered that something is wrong with the formatting of this post, at least on my browser, but for some reason, it is so old that I am not able to edit it. It will have to stay the way it is until I figure out what is wrong. I have some great professional photographs of Gertrude Walker.